Optical drive used to be such a common component that for many purposes, like installing operating system, it was just assumed to be present. But now not so much – devices like netbooks,thin notebooks and SFF computers don’t have a place for optical drive. And people, used to high-speed networks and high-capacity external media, are getting bored with those as well. Microsoft got a clue and now provides Windows 7 USB/DVD Download Tool that allows to easily install Windows 7 from flash drive. App takes ISO image as input and either burns it to DVD or transfers contents to flash drive (at least 4GB required) and makes it bootable. If you are wondering about ISO part – that wasn’t for piracy convenience but because Microsoft Store provides downloads as such images. Process is amazingly easy and straightforward. Making flash drives bootable was historically advanced hack, but this one makes process a breeze and dumbs it down to generic next-next-finish. Microsoft did manage to screw up with initial release – they had used some open source code and failed to mention it. Now that was fixed and app went completely and properly open source. One thing it clearly lacks is option to rip files from actual installation disc. 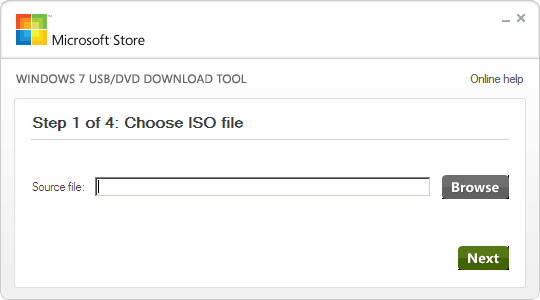 ISO image is nice when you buy online, but if what you have is retail box it will take additional tool to get that ISO image from disc first. I don’t know how will it work with multi-partition flash drives, might be tricky. Also by default format is enforced and there is only obscure workaround with registry key, provided in documentation. Very useful when needed and works like a charm. Its great to see this tool can be used to install windows 7 from usb. Nice tips.